A few months ago, I requested scans of book cover images of books by or about Sylvia Plath that were not already on my website A celebration, this. Two kind people sent me some images, which are now online! I am interested in images of books in foreign languages specifically, to boost the content on the Non-English page. But, I also know I have some gaps in books published in English. So, please help if can! Marnie Pomeroy's contribution to the Greenwich Exchange Literary Series, published in 2006, is one of the briefest introductions to Sylvia Plath available. Its brevity is much more of a shortcoming than it ought to be. Plath's life and writing are well represented in full-length biographical and critical studies; but there is a need still to introduce her to both younger readers and new readers. Many of these younger and newer readers will start and end their introduction to Plath on the internet. Fortunately, there are a few decent and thorough web pages about Plath. That being said, there is - or there should be - a responsibility to make printed introductions readable, factually accurate and, as much as can be, authoritative while still being thorough given the limitations imposed by the series editor/publisher, etc. I found much to dislike in this book. On page 43, the author quotes a journal entry Plath made on 29 March 1958. This is the entry where Plath predicts her future title to be the "Poetess of America." Plath lists her contemporary rivals, "Edith Sitwell & Marianne Moore...May Swenson, Isabella Gardener & most close, Adrienne Cecil Rich." Inbetween Gardner and Rich, Pomeroy inserts "[Anne Sexton belongs here too]". My problem with this is that it was another ten months or so before Sexton and Plath's met. I find it irresponsible to insert Sexton here for the following reason: Sexton's first published poem, according to Northouse and Walsh's Sylvia Plath and Anne Sexton: A Reference Guide, was in August 1958. So, at the time Plath couldn't have considered Sexton a rival because it is likely she hadn't heard of her yet. When quoting Plath or anyone, for that matter, one must occasionally put words into her mouth. And this is likely what Pomeroy was doing. However, by inserting Sexton as a rival inside the quote, it left me with the impression that the insertion was 'necessary' because Plath left her out. Sexton first appears in Plath's Journals almost a full year later on 20 March 1959. Apparently Wellesley is 45 miles west of Boston (Pg 5). The actual distance is about a third of that. And lastly, just to be nit-picky, in one section discussing the poems "Mirror" appears under its actual title as well as under the title "Mirrors". This is just sloppy. These books are only a selection of the more introductory orientated books on Plath. They are better than Pomeroy's contribution not only because they are longer, but the writing is more clear and more focused. Additionally, there is a sense of expertise on the part of the writer and the discussion of Plath's works is much more thoughtful. In some ways, introductory pieces to Plath's life and works are more crucial than critical examinations or full-length treatises. Why? Introductions are first impressions. David Trinidad's article, published in the November/December 2006 American Poetry Review, "'Two Sweet Ladies': Sexton and Plath's Friendship and Mutual Influence", is online here. Trinidad is an the editor, along with Lisa Fishman, Arielle Greenberg, and Tony Trigilio, of the journal Court Green (published through Columbia College of Chicago). The current issue of Court Green features "a dossier on the poet Sylvia Plath". The issue is $10. Tim Kendall, Jo Gill, and the staff at the University of Exeter's Centre for South West Writing are building a web site "to promote the appreciation of the region’s many important creative writers." Check that link often as Plath is a featured writer and her page should be up soon! The website for Plath Profiles is still being developed; but the good news is the issue otherwise ready as papers have been selected. Over the next month there will be some meetings to further develop the site and post the papers. Did you know that Sylvia Plath and the poet Adelaide Crapsey have several things in common? Crapsey, whose last name is unfortunate, is know for her cinquain poetry. In the cinquain, the poem is five lines long, and the syllabic pattern runs 2-4-6-8-2. Plath's poem "Mussel Hunter at Rock Harbor" is her most sophisticated, syllabic poem; though it is a far cry from the simplicity of Crapsey's cinquain. Still dust . . . as strange, as still . . . This calls to mind the last line of Plath's poem "The Bee Meeting", which concludes, "Whose is that long white box in the grove, what have they accomplished, why am I cold?" In Plath's line, grove and cold are internal slant rhymes. In Crapsey's poem, the second to last line ends with grown, which can be heard in Plath's grove. The end of Plath's "The Bee Meeting" is ominous. The next poem in her sequence, "The Arrival of the Bee Box" tells us that the bees inside are "dangerous" and the "maniacs" are "angrily clambering". Plath continues with "Stings", "The Swarm", and finally "Wintering", all of which feature flying, triumphant bees. Crapsey's flying white moth in "The Warning" leaves her feeling cold in the same way as Plath's bees do. Plath's copy of A Comprehensive Anthology of American Poetry, edited by Conrad Aiken, is held at the Lilly Library and contains two poems by Crapsey. Though "The Warning" is not included, still Crapsey may have been familiar to our favorite poet. In 1911, Crapsey taught a course in Poetics at Smith College. But, by 1913, she fell ill and died the next year from tuberculosis. She spent the last, painful year of her life at the TB sanatorium in Saranac Lake, New York. This is very likely the same sanatorium in which Plath's boyfriend Richard Norton convalesced in the 1950s. Plath memorialized her visit to see Norton in the story "In the Mountains" (1954) and later in The Bell Jar. Frieda Hughes came under fire in this article from London Telegraph. On 6 May, the Daily Hampshire Gazette ran an article on the Sylvia Plath 75th Year Symposium at Smith and mentions Julia Stiles' low-profile. This is a subscription newspaper, so anyone with the full-text please feel free to share! Anonymous posted a comment earlier in the week on Bookslut's blog post, Plathophilia: Rereading Sylvia. Lastly, I've added a few book covers to sylviaplath.info. 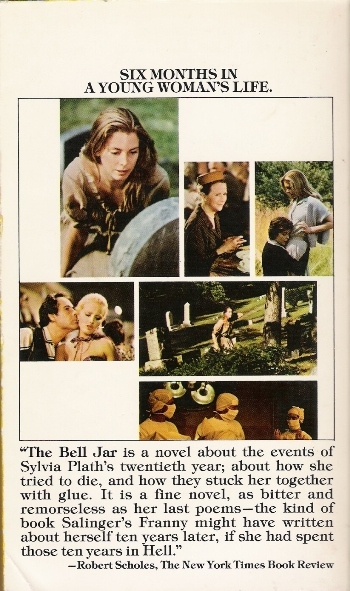 They are a paperback edition of Ariel, a mass market cover of The Bell Jar, and one I'm really excited with, a movie-tie in edition of The Bell Jar from the 1979 original adaptation. I also scanned the back of this edition. Labels: Book covers , Frieda Hughes , Links Etc. The following is a letter from Julia Stiles to Carol Christ, the President of Smith College, regarding the adaptation of The Bell Jar on which she is currently working. Ms. Stiles asked me to post it here as it also addresses Plath's readers. It was a privilege attending last weekend's 75th anniversary Symposium on Sylvia Plath at Smith College, and I wanted to thank you for the invaluable resources made available by your colleagues. Joining me at the conference was a screenwriter I have been working with for the past three years to adapt The Bell Jar into a film. Karen Kukil and Aubrey Menard, who hosted the event, were extremely generous with their time, showing us scores of photos, early drafts of The Bell Jar, Plath's typewriter, and a number of other artifacts in Smith's impressive archives. While at dinner Saturday evening in The Alumnae House, a fourth year student asked me if we were planning to make a "happy, lighter Bell Jar." I laughed at the thought. The student had read online a misconception I would like to clarify. I can assure you that everyone involved in this endeavor understands the huge responsibility of adapting such an important novel. If anything, what we as filmmakers intend is to celebrate the power of Plath's writing, and awaken a larger audience to her talent. Over five years ago, when I decided to try getting the rights to the book, I envisioned a film that could realize the vivid imagery Plath describes, as Esther Greenwood experiences her summer stuck inside The Bell Jar. My intention was never to make a traditional biopic, but instead a film as subjective and at times surreal as the novel itself. Plath is adept at writing visually, so that the reader's perspective is as distorted as Esther's. The difficulty in adapting a novel like this is that so much is established by Esther's interior narrative. On the other hand, Esther's visual metaphors and hallucinatory imagination are perfectly cinematic. Another challenge in making this adaptation is that for many people, Plath's biography overshadows her work. Those unfamiliar with her writing tend to stereotype her as dark and angry, overlooking that she had many other sides to her, all of which are evident in her prose. Moreover, Plath has been posthumously elevated to a kind of cult status, so that some of her fans can be proprietary of that darkness and anger. The narrator of The Bell Jar is undeniably sarcastic and has a scathing wit, even if she is in the midst of a desperate nightmare. Richard Larschan described it best at the Symposium, by calling it Plath's "self-irony." 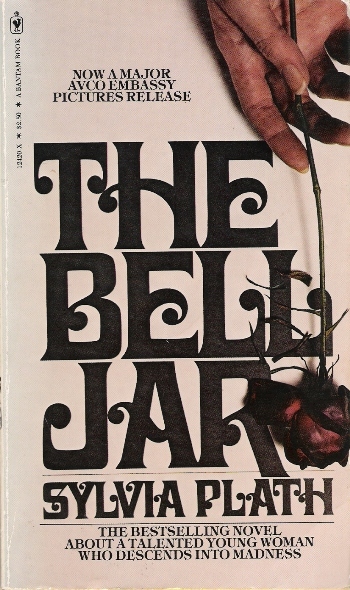 He aptly pointed out that while Esther Greenwood is nineteen in the novel, Plath wrote The Bell Jar years after the incident, at the age of thirty. Naturally, her narrative is more seasoned, mature, and self-aware. For example, in a moment of frustration alone at her mother's house, Esther says to herself, "I'm going to write a novel, that'll fix them!" It is hard to believe Plath meant this earnestly. Later, when Esther nicknames the doctors at McLeans, "Dr. Spleen" and "Dr. Syphilis," we get a glimpse of this overlooked side of Plath. There is no denying that The Bell Jar is a story of depression, attempted suicide, and isolation. It is also, however, an example of the multifaceted life force that was Sylvia Plath. I gather from her many biographies that she was a dedicated and focused woman, whose sensitivity made her a great writer, but also caused her immense pain. Indeed, Plath's life ended very tragically, but the protagonist in The Bell Jar does manage to return to her last semester at Smith. Her return is triumphant, albeit precarious. To ignore Plath's sarcasm, however, as well as her vibrant imagery, would certainly be an injustice to such an enduring novel. We hope to capture the complexity of Esther Greenwood?s story, from the depths of her suffering to the intensity of her perception. I look forward to returning to Smith, and I thank you again for the informative weekend. This is the round-up on goings-on this week! Recently found book titled An homage to Sylvia Plath by Jean Elizabeth Ward on Amazon.com. The book is published by Lulu.com, and came out on 22 February 2008. The price is $22.50 and the ISBN is 143570309X. Books by lulu.com appear to be self-published and/or print-on-demand. Beautiful posters and notecards from the Symposium and for sale through the Mortimer Rare Book Room's website. On 24 April, The Smith College Sophian, a Smith College newspaper, also ran a story on the Plath Symposium. Hopefully the link stays active. 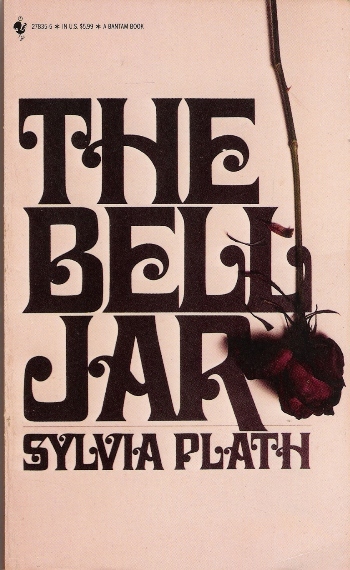 "If the movie based on Sylvia Plath's book "The Bell Jar" is bad, it won't be because the star was unprepared. Julia Stiles is doing some serious homework as she prepares to play the tragic heroine of Plath's one and only novel. Over the weekend, the actress attended a symposium at Smith College commemorating the writer's would-be 75th birthday. (Plath, a Smith alum, committed suicide in 1963 at the age of 30.) We're told Stiles attended every talk of the symposium, taking notes and asking questions of the high-powered panel of Plath scholars. During a discussion with the poet's onetime roommate Marcia Brown Stern, former boyfriend Philip McCurdy, and classmate Elinor Friedman Klein, the actress inquired how the poet "carried herself." In response, McCurdy recalled Plath's "long legs." Stiles, who is producing the movie version of Plath's book, also took a tour of Northampton's Academy of Music Theatre, where, we're told, she may premiere "The Bell Jar." The actress said she'll be back on campus soon to look at a gown once worn by Plath." The Sylvia Plath 75th Year Symposium at Smith College, held on 25-26 April, brought together a wide variety of Plath's readers. Nearly all the papers and presentations given were first heard at the Oxford Symposium in October 2007. Additional content included a fascinating paper by Susan van Dyne ("'The endless gladitorial event': Who was Hughes as Plath's editor? 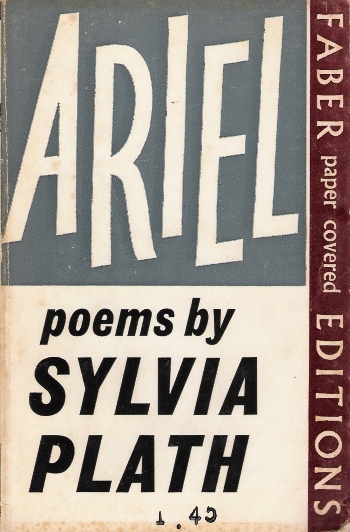 "), author of Revising Life: Sylvia Plath's Ariel Poems, and a panel of friends of Sylvia Plath, which included Judith Kroll, who read letters they received from either Sylvia Plath or, in the case of Kroll, from Aurelia Plath. Attendance consisted mainly of people from the Northampton area, but some drove in from all over New England, or flew in from places as far as Texas and Japan. The events kicked off on Friday with a community reading of Ariel: The Restored Edition. Plath fans, scholars, poets, and other distinguished guests read the poems one by one. Phil McCurdy began the reading with a brief story and a reading of "Mad Girl's Love Song", which Plath wrote circa 1953. A fan then read Plath's "Mirror", before the first poem "Morning Song" really got things going. This was a wonderful way to start the Symposium, and Plath herself joined us as she read "Daddy" from the famous 1962 BBC recording. Her voice joined a chorus of others from the first line, "Love set you going like a fat gold watch" to the last, "The bees are flying. They taste the spring". The Mortimer Rare Book Room, converted for the occasion, was full with standing room only available around the sides and to the back. It was great to see so many Plath fans. Saturday's schedule was full, ambitious, and ran very smoothly from all outward appearances. A tremendous thank you must go to Aubrey Menard and Karen Kukil, and the rest of the Smith College helper-elves, for coordinating the events. The papers, many of which I heard at Oxford, were new all over again. And, particularly nice to hear were the papers I missed at Oxford due to the concurrent session format, which cannot be avoided at such large events. Throughout the day there were breaks, in which we could socialize and idolize. Papers/presentations I missed at Oxford were given by Heather Clark ("Plath and Hughes Redivivus: 'Venus in the Seventh'"), Annie Finch ("Libretto and Imagination: On writing "Sylvia and the Moon"), Diane Hunter ("The Dead Mother Complex between Plath and Hughes"), Patrick O'Connor ("Plath and Global Politics"), Cornelia Pearsall ("'Wars, wars, wars': Plath's Martial Arts"), and Dorothy Wang ("Sylvia Plath, Race, and White Womanhood"). The highlight of the day, however, was the Plath's friends panel at the end of the evening. Stern, Klein, and McCurdy read letters sent to them by Plath, and they each also discussed the Plath that they knew. The stories were warm, funny, and fond, and at the risk of redundancy from my previous post, excerpts can be seen and heard through the Smith multimedia webpage. Judith Kroll recounted stories of her undergraduate times at Smith under the tutelage of Plath's former professor and mentor Alfred Young Fisher, as well as her work with Ted Hughes, Olwyn Hughes, and Plath's Collected Poems, from the mid 1970s. She read a bit from a letter she received from Aurelia Plath, after she met her in 1976 following the publication of her own Chapters in a Mythology: The Poetry of Sylvia Plath. Actress Julia Stiles and actress/screenwriter Tristine Skyler were present, pleasant, attentive, and approachable throughout the Symposium. They are conducting research for their forthcoming film adaptation of The Bell Jar. This is bound to be an emotional project for all, and it was very welcome to see them so involved with the librarians and archivists at Smith, and the Plath scholars and fans present for the event. I was fortunate enough to have their attention from time to time on both Friday and Saturday and really enjoyed the opportunity to talk Plath with such respectable figures. Everyone behaved, and as with Oxford there were no fistfights, brawls, excessive name-calling, etc. I guess the brawls and such will have to wait for the joint Plath/Hughes conference.